and how massage for horses helps them stay healthy! Equine Massage Therapy helps increase circulation, relax muscles, increase range of motion and improve muscle tone in horses, helping them perform, heal, and rest. As massage therapy has gained popularity with humans over the last 20 years, the acceptance of animal massage has also grown. 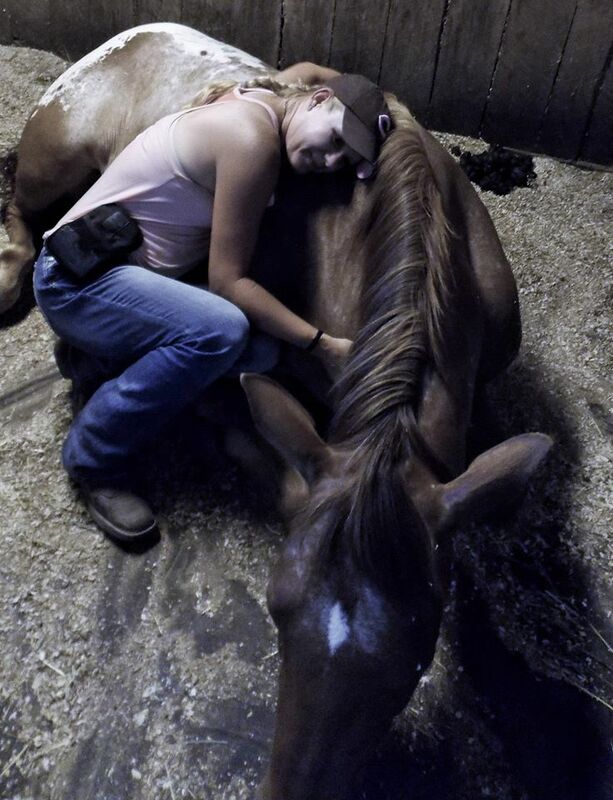 The equine community has seen the creation of professionals like equine chiropractors, and equine nutritionists, but also for different massage therapy jobs with horses - like equine massage therapists for racing/sports horses and equine massage therapists for pregnant horses or injured horses, so the demand is there. Massage therapy can help a horse to be in the best possible health because it not only decreases the chances of muscle strain and tension, but can also speed healing after injuries. Students typically learn massage techniques, physiology and location of muscles, and about certain conditions that might cause a horse to be injured. Equine massage schools for certifications in horse massage can cost upwards of $500-$2800, depending on if you study at home or travel and live at the school for several weeks of training. But, the practitioner will soon receive a great return on that investment. Most certification classes are from 3-5 days, depending on which school you choose, and teach step-by-step how to give a massage for a horse. Read more about high quality equine massage therapy schools. Session prices that certified therapists charge are anywhere from $40-$100 per hour. Every type of business needs a plan. It often saves time, money and stress to have your goals and objectives written out. An equine massage therapy business plan should clearly state your goals and objectives in the first section of the plan. This helps banks or other investors to see how you plan to make money. Objectives/Goals - where you are starting out and where you plan to be in 3 months, then 6 months, than 1 year. Also include 5 year and 10 year goals. Online marketing Plans - if you plan to grow your business via a website, how will you build the site (yourself or hire someone). Will you use SBI! or another website building program? Organizational Structure - Will other therapists or staff work for you or are you a sole proprietor? Above all, make sure you clearly communicate how you will make and spend money and what your back-up revenue generation will be if things don't go as planned. If you are interested in learning about how to give a massage to horses from the most respected instructor of this technique, this DVD will provide all the information you need to get started. Whether you are an owner, rider or trainer, Jim Masterson's Equine Massage DVD, showing 24 specific techniques to loosen muscles and increase performance, can help your horse jump better, move faster, and run longer. This 75 minute hands-on guide also provides 30 great massage tips for a successful treatment. Jim shows how to use the horse’s response to guide your treatment. Once you learn the 8 responses to look for, you will know exactly how to give a massage, where to work, and for how long. This is one of the best massage videos and step by step guides, and each technique is clearly shown and explained in detail. The instructor demonstrates a complete treatment covering the neck, shoulder and back. He has used these massage techniques to improve performance on over a thousand horses! Read more about school training at Western Montana School of Equine Massage! For whatever reason you choose to learn equine massage, know that you will be helping the horses you work on to feel better, move easier, and heal faster from injury or surgical procedures.